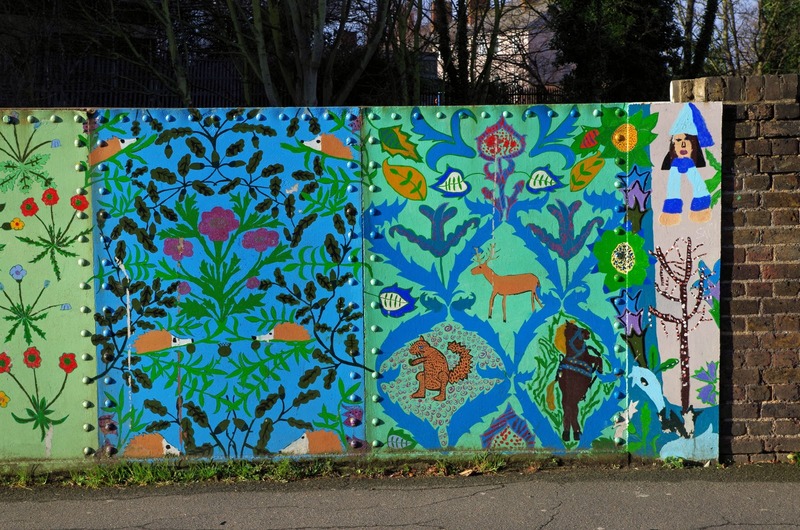 The area around Stoneydown Park is home to some of the oldest and most successful street art in Walthamstow. 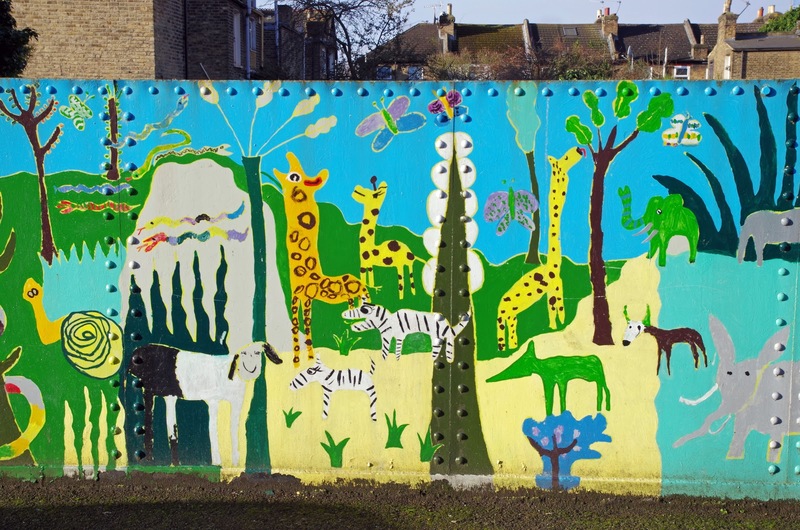 In 2007 the pupils of Stoneydown Primary were involved in a project to decorate the railway bridges that many of them passed on the way to school. 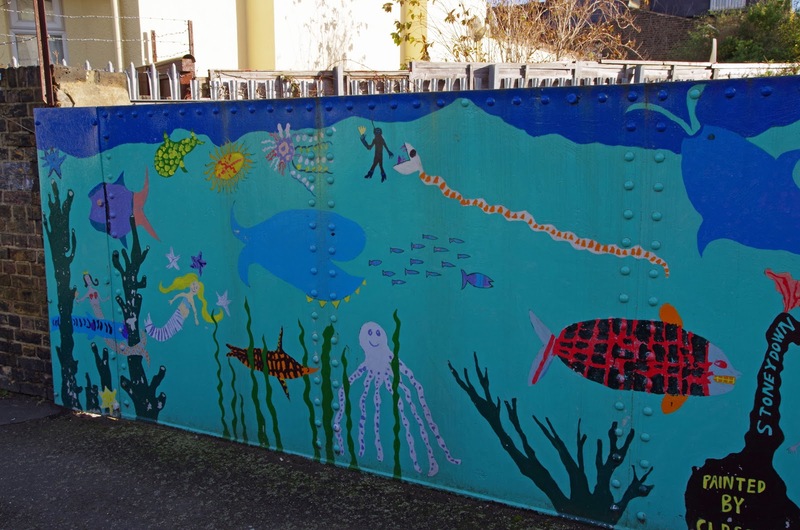 The whole school was involved, with local artist Linda Hughes helping the pupils develop their ideas for each section. 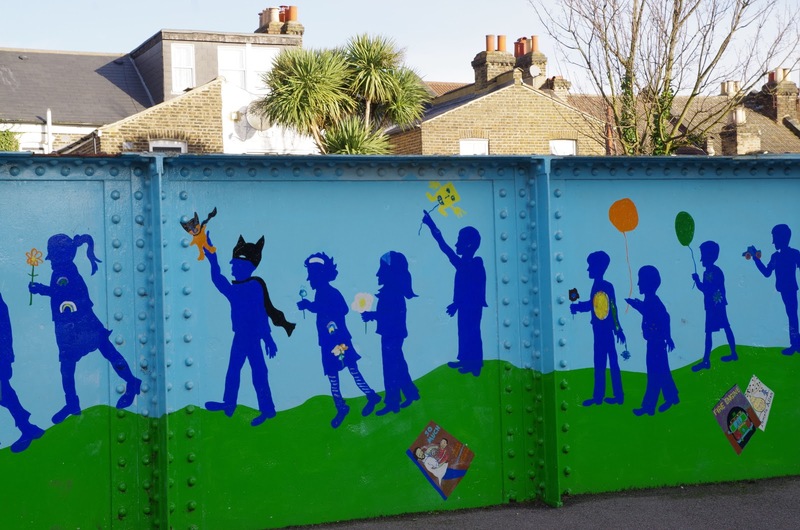 The aim was partly to wipe out the graffiti that the plain metal surfaces attracted: "Youngsters get arty to beat graffiti", as the Waltham Forest Guardian reported it at the time. The area is a grid of terraced houses, still more or less the same as when they were built around 1900, except that the railway line slices through on a diagonal, taking the direct route from Walthamstow Central down to Blackhorse Road. Construction must have involved huge disruption and the demolition of many houses, as you can see from the exposed chimney breasts on the gable ends of the houses nearest the railway cutting. New bridges were built to connect the roads that were cut by the railway. The bridges are still there, typical railway structures with brick piers and - the part you see from street level - iron plates fastened together with rivets. There is nothing slapdash about these murals. Each is both technically competent and well thought out. The murals are a nice combination of strong underlying design and childish inspiration in the details. William Morris evidently provided the source material for some of these. Thanks to some very thorough preparation and a clear protective coating, they are still fresh and vibrant after nine years. The bridges are on Pretoria Avenue, Stoneydown Avenue, Ritchings Avenue, and Suffolk Park Road. The bridge on Warner Road has brick parapets, and isn't decorated. 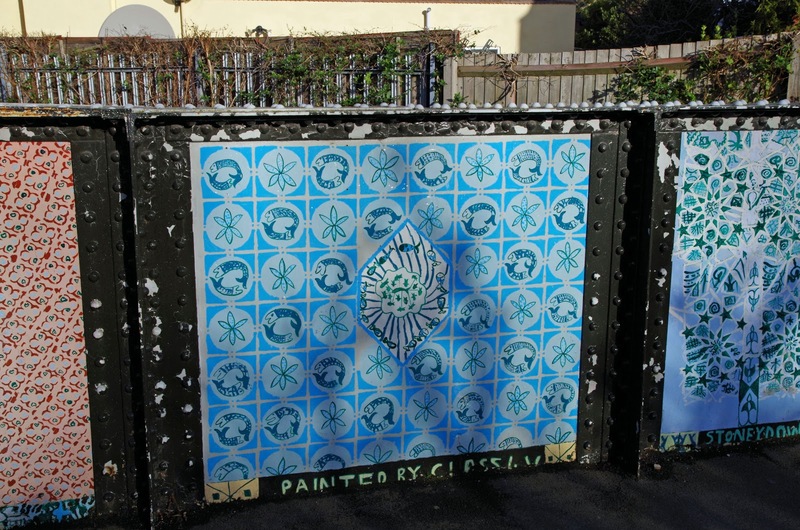 The Northcote Road bridge (not illustrated) was painted two years later, in 2009, by pupils at Willowfield School. * Linda Hughes is the artist responsible for last year's Art Trail Guide cover.